Pallet Flow Racking, or 'Pallet Live Storage' is ideal if you operate a First-in, First-out (FIFO) goods storage setup. 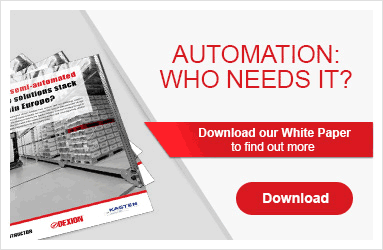 With this system you can use up to 60% less space than if you were to use conventional pallet racking. Our Pallet Flow system offers a dynamic storage solution with integrated conveyor modules to suit most pallet types and sizes. It's well-suited for the drinks industry or as a buffer storage facility in manufacturing. Pallets travel smoothly on full-width or twin-track rollers. While the front pallet is removed on the front side of the rack, the rear pallet is held back. Pallet movement is always safe and smooth thanks to automatic braking, along with a combined load guide and end stop unit. Other dimensions can be manufactured according to your requirements. Please select your country for more information on the systems available.